We are located between Pardeeville and Portage, Wisconsin. We live on a beautiful, quiet country setting with many country acres. Amongst the wildlife and dogs here, we love to spend our time retrieving and swimming with our labs. Here at Dutch Acres, we strive to produce pups with excellent health, temperament and conformation. It is our love for dogs and life long passion that helped create Dutch Acres. 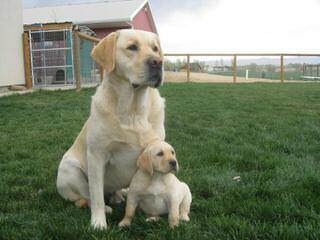 We have been reputable breeders of Labrador retrievers for the past 16 years. We take great pride in the puppies that we produce. We are looking for a Black Lab Puppy. Do you have any avail. or know of someone who does , ready to take home at the end of August?